Mammut Avalanche Safety: Tech Tips: The "Landing Strip" fine search...what is it? Tech Tips: The "Landing Strip" fine search...what is it? Many instructors teach a 2-axis grid fine-search. However, many people end up performing a pretty sloppy grid search, complete with excessive movement of the searching beacon and elevation changes that affect the ultimate accuracy of their pinpoint location, and spend a lot of time doing so. One alternative that is easier and faster for many people is to teach the "landing strip" fine search. Mammut prefers this approach, especially with newer practitioners, to try to improve the efficiency of the search. 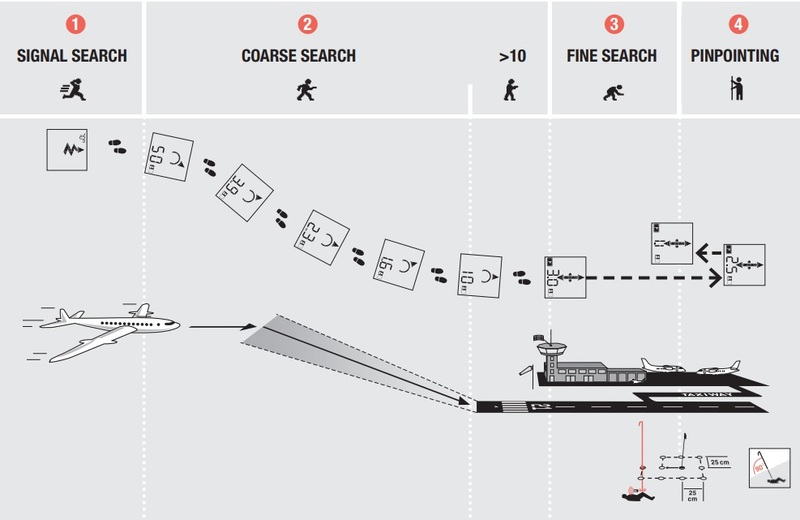 In this case we can take 2 approaches to improve the efficiency of the fine search--we can do this through TECHNOLOGY such as that used in the Smart Fine Search in the Barryvox S, or we can do that through TECHNIQUE, such as the "landing strip" fine search here. The "Landing Strip" is the extension of using an airplane and airport as an analogy for doing a beacon search. When you are really far away from the airport, you can fly high and fast, and directional changes wont affect your ability to make a safe landing--we liken this to the signal-search phase of a beacon search. The "airport" analogy for a beacon search has the rescuer slowing down and holding the beacon lower as they approach the buried subject, similar to a plane slowing down and losing elevation when approaching the runway. As you get closer, the airplane needs to slow down a bit and lose elevation, and needs to reduce any maneuvering in order to come into the airport in the correct direction--this is akin to the coarse search. In the final approach to the runway, the plane needs to slow way down, lose most of its elevation and come in very straight--this is the fine-search. For this reason, when we teach beacon-searching, we use a "airport" visual. slow from the 10m distance indication (remember our landing airplane analogy) and concentrates on coming in precisely following the digital search arrow. When the search arrow transitions to the fine-search icon--the "landing strip" icon on the new Barryvox Transceiver or an Element Barryvox--they hold the beacon at knee height and move forward until the numbers increase, then back along the same axis to find the lowest number, mark this spot...and then instead of continuing onto the second axis of a grid search, the rescuer immediately starts probing in a spiral. The theory behind this is twofold: 1) the rescuer can usually make a number of extra probes faster than they can complete a flawless grid-search, and so in most cases (especially for those who are new to avalanche rescue or who haven't practiced a lot) it will be faster to dispense with the second axis of the grid-search entirely, and spend that time probing. 2) In addition, this prevents the area where you will be digging from becoming excessively compacted, which makes digging physically easier. The fine-search icon on the new Barryvox, on the Element Barryvox and the "airport" fine-search option on the Pulse Barryvox firmware3.2 and newer, are all designed to encourage use of the "landing strip" fine-search technique, with the little "nubs" on the x-axis acting as a cue for those who prefer a traditional 2-axis grid fine search. Rescuers that practice a lot and have very disciplined search technique may still prefer a traditional 2-axis grid search, but the next time you practice with others try it and see what you think--we'd love to hear what your groups results are. Excellent post Dave. I wanted to add a point: Often times, as you mention, the rescuer performs a rather sloppy "Grid on a Cross". In addition, the snow underfoot becomes work-hardened while the rescuers tries to gain less than a meter of greater accuracy. In such instances the work hardened snow is much more difficult to remove, so the search--while perhaps 30cms more accurate, is in fact much slower. Mammut has been trying to improve rescuers efficiency during the fine search through two approaches: TECHNIQUE and TECHNOLOGY. The Landing Strip approach is a technique to maximize efficiency. The SMART SEARCH function on the Barryvox S is a technology approach aimed at solving the same problem.